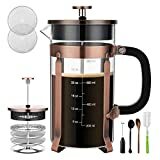 POWERFUL FILTRATION SYSTEM - The double mesh filter is a significant improvement over other French presses, and really helps minimize the amount of residual grounds in your coffee, thus producing a cup of coffee that is just as pure and tasty as coffee made by professionals. FOOD GRADE SAFETY MATERIAL - All our metal parts are made of 304 stainless steel, protecting the coffee press from rust. The large carafe is made of heat-resistant borosilicate glass, which can withstand boiling water! The plastic lid strainer and the measuring spoon are both BPA-Free. 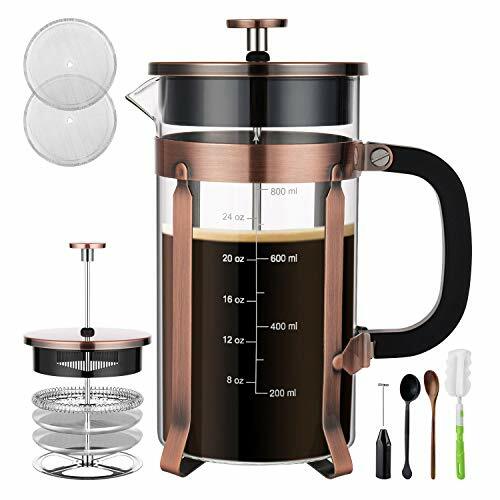 PRECISE SCALE LINE - Our French press coffee maker has a precise scale line, so you can accurately prepare the amount of coffee or tea according to your needs. In general, the coffee maker can make 8 cups of coffee at a time. For an 8-ounce cup, 1 to 2 scoops of coarse ground coffee is recommended. EASY TO CLEAN - The filters are polished (so don't worry about being hurt) and can be taken out by screwing the piece off. You only have to rinse with water and clean it with a sponge. The French press coffee maker is Dishwasher Machine safe, so you can place it at the top rack of your dishwasher to clean.